Hello! 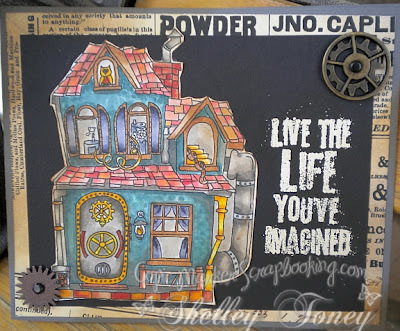 I am so happy you made it all the way to my blog along this fantastic blog hop featuring the awesome digital stamp creations from Copic Marker Scrapbooking. If you stumbled upon my blog by accident and want to start from the very beginning...hop on back to the beginning by going HERE. And...you are going to want to because at each of the blogs there is a Secret Letter (sometimes not so secret) and if you put them all together and leave some comment love at each blog along the way...you can have a complete set of these fantastic images...all yours...for the big ol' price of Nuthin'. Yes, that be true. Just email Colleen the word...and she will send those out to you via email. Here is a list of all the blogs...you don't want to get lost! Shelley: (Heartstrings) Yep, this is me! What is steampunk? Well, if you haven't figured that out by now, I will give you my interpretation. I think of it as a genre that is sort of like Jules Vernes meets Wild, Wild West, meets the Victorian era. Mechanical, Sci-fi and a little bit gothic. I love it! And here is what I created with all of the images that can be yours too! I think this tag/card turned out to be my favorite. I did a lot of experimentation with Perfect Pearls and resist stamping. I am going to use this for the perfect graduation card! this incorporated 2 of the stamps available. I thought they made a nice couple together. I think she is a little sassy and stylin. I have a Victorian dollhouse that I have been trying to build for a few years now. This house reminds me of it so much. I also think...colored the right way, this would make an awesome Halloween house come October! And really...a mechanical owl really just says it all. We hope you loved our Steampunk Blog Hop. 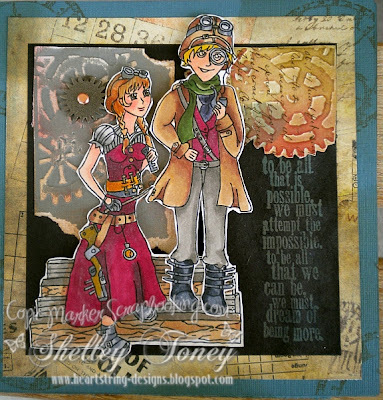 Be sure to leave a comment on ALL of the blogs and collect your letters (as in mine...it would be the letter "N") to be eligible for the free set of Steampunk Stamps from Copic Marker Scrapbooking. Don't forget...one very lucky winner will also receive a brand new set of the new Sketch Marker colors that were just released!! Happy Hopping Everyone!! For your last stop on your journey, hop on over to Torrey's Blog! Great Stuff Shelley - I'm just hopping through all the blogs checking everything out... our hop is WORKING! I agree I love the balloon tag. It will make a great graduation card. I love all of your projects the balloon tag is very cool for a graduation card! I want to make one for my niece who is graduating too! Amazing!!! Love them all, but like you, I LOVE the balloon. Fabulous backgrounds on each of your cards - just perfect for all the images. These are great! These steampunk stamps are a new look and I love them. Love the balloon card, my fave! She definitely is sassy and stylish! Really love your creations! Love how your balloon turned out. OM Goodness, I have never done Steampunk and even asked a friend what it was! And here comes Making Our Mark! Thanks for the images I will receive! And the chance at the Copics. Coloring is superb! You are fantastic! So excited! Can't wait to color! What an amazing array of projects you have designed with these images. Great colouring throughout and thanks for the inspiration on all things steampunk. Oh My! Fabulous projects! You went all out and your coloring is wonderful. Thanks for sharing. Awesome job.. just loving your creations and the blog hop. Awesome card, and I agree with you, the house would make a cool Halloween card if colored correctly. Nice job on all the digi's, but really love the balloon! I love the colors and techniques you used on the balloon tag!! Wonderful!!! I haven't ventured into Steampunk yet but after this...hmmm I think it is something I could love. Great cards. I love the coloring on the balloon. Your description of Steampunk was perfect and you really nailed it with your projects! I even mentioned on an earlier blog that I thought the house would be great for Halloween~totally agree with you there. TFS! Excellent. Thanks for sharing your hard work. Great job on all the digis!! Beautiful cards....am loving the hop. 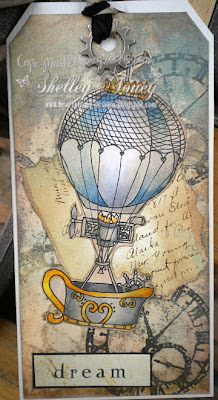 I love the balloon tag but all your projects are fantastic and i love the copic work. I really love your work - gorgeous! Of Course I LOVE, LOVE, LOVE your cards---the tag is my fav--love the colors and the techniques you used! Oh my. Those are all spectacular with great coloring and design. Shelley, Shelley, you were so ambitious for this hop. What fabulous projects -- love them all!! Your favorite is my favorite too! Great card choices with these stamps ! Having a fun time hopping Seeing great images! Love the balloon tag! Great creations! I love that tag! Thanks for sharing with all of us in this blog hop. love what you've done! so awesome! congrats on the blog hop! I really like the colors you used on the house. Hi Shelley! I love your work!!! Shelley I love your work! I think the tag is my favorite too but only because I am addicted to tags at the moment anyway, who knows what the wind will bring along tomorrow, LOL! TFS and all your hard work! It is amazing how you can have the same images and the end products come out so different...they are lovely!! I love your balloon and what you did with the liquid pearls!! The colors and everything are just awesome. Whoever gets this will enjoy it. oooooh wow this is so very cool! love your projects!!!! Amazing projects! inspiration for all of us! I'm totally loving your tags and cards. Wonderful colors and perfect details . Love love love your projects, they are absolutely amazing. thanks for sharing. Love all the projects. My first time seeing steampunk and it is awesome! Great projects...I particularly LOVE the tag with the hot air balloon! Your description of Steampunk is right on! Those images are so unique and fun. Great cards! This blog hop is so cool because it's great to see how everyone brings these images to life!!! Your coloring is wonderful and so are your cards!!! And your choices of colors are amazing!!! wow! LOVE all your samples! Love your colour-schemes and what you have done with all the images! Great inspiration! You have created wonderful cards as a reminiscent of the great era-victorian and punk! Nice job1 I love your coloring! Magnificent work! I especially love your colour treatment on the balloon. The possibilities are endless with these digis. I just recently became aware of the "steampunk" genre. I think I am going to like this. Wow, you have been busy. You managed to make some wonderful cards with these images. This will be my first hop…so excited! Wow you've been busy too! Lots of fabulous creations here - thanks so much for the inspiration! Love all of the images they are fantastic, steampunk rocks! Wonderful images, loving the steampunk! I agree with you about the tag being super special. However, all of your projects are super! That is a beautiful balloon! You were busy using so many images! Your balloon tag would be perfect for an engineering grad I know. Awesome! Your tag is my favorite. Thanks for the inspiration. Just discovering Steampunk & loving it! Amazing projects Shelley & greathop! Your work is awesome! Absolutely love the balloon tag! All of these are fantastic. Really adore the tag! Great projects. I love the coloring & embellishments on all of them! cool cards, thanks for the letter, i thought i know what the word would be but i am more confused. thanks for sharing your talent. Boy you have been busy fabulous stempunk projects. I love your description of steampunk. Your work is very nice. Fabulous job... Love the owl card. What fab creations, thank you for the letter and the hop!! Great stuff. Really love the tag. The background work looks amazing! These are very inspirational to me. I really enjoyed all the detail. Great job! Loving all your work but that tag is my fav. Thanks so much for sharing...Fantastic work! Shelley, your work is unbelievable. I love how you use the colours. All of these are terrific! I love the house and the hot air balloon! I love your work, especially the hot air balloon! It is all wonderful, but that tag is great! Your projects are beautiful. My fav is the tag I love the vintage feel and colors. Love the balloon card. The balloon and the owl are my favorite stamps. Absolutely gorgeous work. Love, love, love the balloon. Your work is fabulous! I adore your tag most of all, although your first card is also divine - okay, they all are!! I also love your definition of steampunk. I've heard a lot of them but that's terrific! Love all your cards and coloring!! what wonderful coloring. My favorite is the hot air balloon. Great stuff! Love your Bubo! You made all of them so fun and stand out. had to look at them so many times. very fun.